We’d love your help. Let us know what’s wrong with this preview of A Morbid Taste for Bones by Ellis Peters. In the remote Welsh mountain village of Gwytherin lies the grave of Saint Winifred. Now, in 1137, the ambitious head of Shrewsbury Abbey has decided to acquire the sacred remains for his Benedictine order. Native Welshman Brother Cadfael is sent on the expedition to translate and finds the rustic villagers of Gwytherin passionately divided by the Benedictine's offer for the saint's relics. Canny, wise, and all too wordly, he isn't surprised when this taste for bones leads to bloody murder. To ask other readers questions about A Morbid Taste for Bones, please sign up. what are some facts about cadfael? Edith He participated in the Crusades, and he was captain of a ship. He is the herbalist at the Shrewsbury Monastery. How do the secular/Natural and the spiritual/Supernatural interact with one another? The Potter's Field Great historical mystery series. "Justice can be arrived at by more routes than one." I thought this book was a swell start to this series! Brother Cadfael, monk by vocation and detective by circumstance, is a really delightful character. A medieval-time, Welsh-born man, Cadfael now carries out his monastic duties at Shrewsbury Abbey in England. He has not been in the service of the church his entire life, however, and that is what makes him such an intriguing fellow. "For Brother Cadfael had come late to the monastic life, like "Justice can be arrived at by more routes than one." I thought this book was a swell start to this series! Brother Cadfael, monk by vocation and detective by circumstance, is a really delightful character. A medieval-time, Welsh-born man, Cadfael now carries out his monastic duties at Shrewsbury Abbey in England. He has not been in the service of the church his entire life, however, and that is what makes him such an intriguing fellow. "For Brother Cadfael had come late to the monastic life, like a battered ship settling at last for a quiet harbour." A former soldier and captain of a ship, Cadfael has even experienced his fair share of sweethearts – "he remembered other ladies, in more lands than one, with whom he had enjoyed encounters pleasurable to both parties, and no harm to either." You can’t help but adore this guy! While Brother Cadfael may be well-liked, author Ellis Peters also introduces us to some less agreeable characters as well. Prior Robert cuts a splendid and authoritative figure, and is well aware of this fact. "For whatever virtues might be found in Prior Robert, humility was not one, nor magnanimity. He was invariably sure of his own rightness, and where it was challenged he was not a forgiving man." The prior’s latest ambition is to acquire the relics of a saint in order to advance the prestige of the monastery. Thus begins an adventure to Wales in search of the resting place of Saint Winifred. Prior Robert bands together a small group of his monks to carry out his mission, Brother Cadfael among them due to his Welsh background. He will serve as translator between the Shrewsbury brothers and the people of Gwytherin. Upon their arrival at Gwytherin, the monks quickly realize that despite the fact the saint’s grave has been neglected, the villagers are not necessarily keen to give her up to a group of strangers. Here we meet another group of interesting men and women; Peters certainly delivers in her characterizations! I loved that she also included a strong female figure in a young woman named Sioned. Brother Cadfael is not without a great sense of respect and admiration for her as well. "There are women as strong as any of us, and as able." Recommended to Werner by: I was a fan of the PBS Brother Cadfael episodes on Mystery! Note, Aug. 7, 2017: I edited this just now to correct a minor typo. Dame Edith Pargeter had already, by 1977, made a reputation for herself, under the pen name of Ellis Peters, as a mystery writer; but under her own name, she was also a respected author of historical fiction, much of it set in medieval Wales. When she brought the two genres together in this first of many novels, set in the border country between England and Wales (where she grew up) in the turbulent mid-1100s and featuring Brothe Note, Aug. 7, 2017: I edited this just now to correct a minor typo. This book is actually quite good. I must admit though, I had a hard time getting through it. In fact, I pretty much had to sit myself down and force myself to read through to the end. I’ve decided that has much more to do with me than the book itself (consequently my high rating). The truth is, I just don’t like mysteries, and now I know that even by setting the mystery in a fascinating time period, this doesn’t change. When I was younger, I used to read every Agatha Christi ‘Poirot’ story I cou This book is actually quite good. I must admit though, I had a hard time getting through it. In fact, I pretty much had to sit myself down and force myself to read through to the end. I’ve decided that has much more to do with me than the book itself (consequently my high rating). The truth is, I just don’t like mysteries, and now I know that even by setting the mystery in a fascinating time period, this doesn’t change. When I was younger, I used to read every Agatha Christi ‘Poirot’ story I could get my hands on, and I think I burned myself out. Most of the time I just don’t care about ‘whodunit’. This leaves the magnetism of the detective to carry the story, which recently just hasn’t been enough. For people who love mysteries though, I think you will love this. Peters writes very well. She uses dialogue to bring her characters to life, and it’s great. I was surprised at how funny this book was. Cadfael is simply a GREAT character. Peters also captures the 1100s with insightful details into monasterial life. I think so many authors forget how powerful and important the church truly was during this time. This same attention to detail was used on the inner workings of a medieval Welsh village too. So many books just make out the villagers out to be ignorant clods, but Ellis is much more generous than that, giving everybody a more rounded feel. Everybody has a different agenda and a different motive, and Cadfael is able to work this out quite clearly and succinctly. Maybe someday I will be in the mood to read another Cadfael book, but I think I’m going to skip historical mysteries for a while. I do believe this is the crème de la crème of historical mysteries though. I am quite sure that I used to own a copy of this novel, back in the early 1980s. I finally donated it because I just couldn’t get into the story. Now, I look back at my younger self and shake my head, because this time around I found the story to be very accessible and very easy to engage. Another instance of the right book at the right time—not suitable for me in my 20s, but eminently suitable for me in my 50s. I think that Brother Cadfael will become an old friend—I will certainly be reading t I am quite sure that I used to own a copy of this novel, back in the early 1980s. I finally donated it because I just couldn’t get into the story. Now, I look back at my younger self and shake my head, because this time around I found the story to be very accessible and very easy to engage. Another instance of the right book at the right time—not suitable for me in my 20s, but eminently suitable for me in my 50s. I think that Brother Cadfael will become an old friend—I will certainly be reading the next book of the series! In my opinion, Peters transplants the murder mystery genre into medieval times extremely well. She gives Brother Cadfael common sense and logic to work with, plus a good dose of human psychology. How he deals with the Church hierarchy and the other Brothers feels very real and is often amusing. The action begins slowly—the reader must be patient as Peters builds the story towards the murder, but after that, the action is unabated until the final resolution. This story is quite different from the forensic-based murder mysteries that crowd today’s shelves, but that very difference recommends it. Not exactly a cozy mystery, but a gentler one. No gore or psychopaths to deal with here. From the stuffy, overblown Prior Robert to Brother Cadfael himself, every character is believable and interesting. You soon realize that it takes all kinds of make a religious, just as it takes all kinds to make a secular, world. Cadfael is a late-comer to the calling, a sort of retirement job for him, and that I think is his primary strength. He can see both inside and outside the religious community very clearly, and he brings enough of the worldly with him to recognize the emotions and failings of men, even those who claim spirituality. $1.99 Kindle sale, today (Dec. 13, 2017) only. Some of my GR friends love this medieval mystery series, so I think I'm going to give it a shot. Marvelous story. You have to read it to find out exactly what happens. A fun spoof on religion. The historical detail, the characters, and the humor are enchanting. By the end I loved Brother Cadfael and all the villagers of Gwytherin, Wales. An utterly charming tale and funny too! I first read Brother Cadfael over 30 years ago during high school and college breaks; I became addicted and thus became a lifelong love of accurate and well-written historical mysteries. I’d seen reviews by GR friends and felt it was time to revisit Shrewsbury and the delightful world of Cadfael. This was a very satisfying re-read for me, and I’ll be revisiting this series again in the new year. I love Cadfael’s decency, warmth and humanity - and humor. Same reason I enjoyed Margaret Frazer’s Dam I first read Brother Cadfael over 30 years ago during high school and college breaks; I became addicted and thus became a lifelong love of accurate and well-written historical mysteries. I’d seen reviews by GR friends and felt it was time to revisit Shrewsbury and the delightful world of Cadfael. This was a very satisfying re-read for me, and I’ll be revisiting this series again in the new year. I love Cadfael’s decency, warmth and humanity - and humor. Same reason I enjoyed Margaret Frazer’s Dame Frevisse series; a smart, strong, experienced religious makes a wonderful detective! This visit to a Welsh kingdom to acquire the remains of a saint for Shrewsbury Abbey stirs up unforeseen conflicts and a murder, and we are introduced to several wonderful Welsh characters, along with Cadfael’s English fellow religious, some truly good, some cynically manipulative of the faith of others. My first by this author introducing Brother Cadfael who's powers of observation and deduction ensure that he's always a part of the action and at times a little above the law. I enjoyed his character, he has a bit of a history, is not exactly pious and is a bit cheeky. Δεν θυμάμαι πολλά από το 1994 που το διάβασα, είναι η αλήθεια. Σίγουρα πάντως δεν ήταν κάτι σπουδαίο. Πρέπει να αρχίσω να μοιράζω βιβλία, μου φαίνεται. I read some of the Brother Cadfael books years ago & found them just ok. May have been my age or (more likely) that this is a series that needs to be read in order. Clearly there is more to the good brother than his skills as a herbalist! No doubt more will be revealed about his past in later books. I don't know anything about 12th century Wales or England, but certainly Peters had given the narrative & dialogue a very authentic feel. & monastery politics feels like modern office or s I read some of the Brother Cadfael books years ago & found them just ok. May have been my age or (more likely) that this is a series that needs to be read in order. Clearly there is more to the good brother than his skills as a herbalist! No doubt more will be revealed about his past in later books. I don't know anything about 12th century Wales or England, but certainly Peters had given the narrative & dialogue a very authentic feel. & monastery politics feels like modern office or school staffroom politics & gave me a sly chuckle! kratko, zanimljivo, na momente malo suhoparno, no vrlo dobro djelce. pogotovu kad zamišljaš likove iz serije. 2.0 to 2.5 stars. I picked this book up after really enjoying Dissolution by C. J. Sansom and wanting to try another historical mystery. While well written, I found this book to be fairly dull and the main character not nearly as interesting as Sansom's Matthew Shardlake. Not horrible by any means, just not great. So this was my first foray into Ellis Peter's quaint medieval world of a man who's opted to live out his golden years as a brother in a Benedictine monastery in Shrewsbury, England. Brother Cadfael has found his calling as an herbalist and gardener and takes pride in ferrying the younger brothers of the order through their novitiates. He's lived a full and varied life, traveling the world as a soldier and sailor and getting his share of the ladies while he was at it. As the story begins Prior Ro So this was my first foray into Ellis Peter's quaint medieval world of a man who's opted to live out his golden years as a brother in a Benedictine monastery in Shrewsbury, England. Brother Cadfael has found his calling as an herbalist and gardener and takes pride in ferrying the younger brothers of the order through their novitiates. He's lived a full and varied life, traveling the world as a soldier and sailor and getting his share of the ladies while he was at it. As the story begins Prior Robert, an ambitious monk, has convinced their Abbot that he should be allowed to travel to Whales and retrieve the bones of a Saint interred there so she may be housed in glory at the Abbey. Robert and his supporters make a lot of noise about visions of the saint telling them she wants to be moved to Shrewsbury and the kindly, but not terribly shrewd abbot grants permission. Cadfael, sensing something amiss and not liking the notion of disinterring a saint from the land she loved, worms his way into the group and they set out. Its not terribly surprising when the monks are met with a certain amount of resistance from the Welsh who are in no hurry to lose their saint. Matters take a turn for the worse when a local lord, who was the most vocal in his disapproval of the plan, is discovered murdered. Suspicion immediately follows on one of his most trusted servants who wished to marry the lords daughter against his wishes but Cadfael is sure something and someone else is behind the killing. This is an excellent, well written traditional whodunnit with a unique setting and wonderful characters. Peters background as a historical writer is very much in evidence, she knows her stuff and the England she writes about is a fascinating, beautiful, and sometimes brutal place. Cadfael is a terrific character. He's charming and kind, immediately putting people at their ease. He's a natural peace maker and has a knack for getting to the heart of any conflict. He has a good instinct for people too and this puts him in an excellent position for tactfully manipulating people out of trouble. He's also a genuinely good person. Peters doesn't go into a ton of detail in this book but you get the sense that Cadfael is not necessarily proud of all the decisions he's made in his life. His decision to dedicate the rest of his life to service and good works seems to be motivated, at least in part, by a desire to make up for some of those mistakes. So unlike some of the ambitious, malicious monks in the order who are looking for prestige and personal advancement his motives remain pure. I really enjoyed this. Peters spins a good yarn and the mystery is a good one rife with unspoken passions and misguided devotion. I sincerely enjoyed trying to work out who was behind what and hoping everything would work out in the end for all the good guys. Check this series out if you dig historical fiction with a good dose of murder. It does not disappoint. Ah ha! We meet at last Brother Cadfael. Pray tell, Brother, was it as boring for you as it was for me? I have heard much about the Brother Cadfael series and heard plenty of good reports on the books, including the first book in the series. This one. A Morbid Taste For Bones. Having been one of the only English speaking persons in the world to have never read any of the books or watched any of the tv shows I have had A Morbid Taste For Bones on my radar for a goodling amount of time. Always putti Ah ha! We meet at last Brother Cadfael. Pray tell, Brother, was it as boring for you as it was for me? Having been one of the only English speaking persons in the world to have never read any of the books or watched any of the tv shows I have had A Morbid Taste For Bones on my radar for a goodling amount of time. Always putting it off for whatever reason...I am not sure now what they were. My Ellis Peters blooding was a successful one and came in the form of one of her historical fiction books written under her other pen name, Edith Pargeter, which I read last year. That was A Bloody Field By Shrewsbury. The memory of her incredible writing in that book still makes my toes curl to this day. I loved it. It became one of my all time favourite historical fiction books. It was this lingering taste of the author's work that made me clear the schedule this month and finally read the first Cadfael. But next to the Classicist nature of A Bloody Field by Shrewsbury, I am afeared A Morbid Taste For Bones presents like the poor, country cousin. The writing quality I recognised, although it was more Shakespearean than Classicist in this historical mystery. For me there was no story of interest propped up by the intelligent writing. It took far too long to get to the crime and then I really couldn't care less who killed whom and why. The scenes kept reminding me of a drawn out Shakespearean play. Good for someone watching in the back seats of a dusty old theatre with their mouths agape, leaning forward, their fists clenched in anticipation of events, but for me as a reader, it was more like a two hour train ride. Very little bumps and very little entertainment unless I bring it myself. This may seem sacrilegious to those who love these books and the tv series, but I could easily have given this book 2 stars instead of 3. If it were not for my immense admiration for the way Ellis Peters strings her old fashioned words together, I would not have been so kind to A Morbid Taste For Bones. The head of the Benedictine Abbey in Shrewsbury, England, sends an expedition of monks to retrieve the remains of Saint Winifred from her resting place in Gwytherin, Wales. But the villagers of Gwytherin are not uniformly keen on the idea of losing their beloved saint. When the leading opponent to moving the saint’s bones is found dead, apparently shot with an arrow, some take it as a sign that the Saint approves the move. But Brother Cadfael recognizes that the murder was done by a human, and t The head of the Benedictine Abbey in Shrewsbury, England, sends an expedition of monks to retrieve the remains of Saint Winifred from her resting place in Gwytherin, Wales. But the villagers of Gwytherin are not uniformly keen on the idea of losing their beloved saint. When the leading opponent to moving the saint’s bones is found dead, apparently shot with an arrow, some take it as a sign that the Saint approves the move. But Brother Cadfael recognizes that the murder was done by a human, and though he is an outsider, he begins to investigate. I’ve heard about this series set in 12th century England for some years, and always wanted to try them. I found it rather slow moving; the murder doesn’t happen until page 68. Granted, as the first in the series, Peters does have to spend more time in establishing the characters and setting, but I like my mysteries – even the cozy mysteries - to move along at a brisk pace. I really liked Brother Cadfael as a central character, however. He is a keen observer and is methodical and deliberate in his investigation. I also rather liked his rather unorthodox approach to solving the mystery and achieving justice. I’d be willing to read another in the series. Didn't read this enjoyable informative series until after retiring. Exceptional treat to spend time with Brother Cadfael, made rare by not experiencing series burnout. Glad I could read them all in a short time span. For Cadfael fans, you might also like the author's Heaven Tree trilogy, perhaps try the first volume. In time and setting context, perhaps Penman would appeal with Here Be Dragons. Having enjoyed the TV series (starring Derek Jacobi as Cadfael), I've long wanted to read the books on which they were based. This first book in the series was a treat. Peters has an easy writing style, and the story was intriguing and kept my interest, even though having seen its TV twin I knew how it would play out. There are many parallels to the TV adaptation, but also some slight changes as well, which was ok. Brother Cadfael is a wonderful leading character. I am looking forward to seeing Having enjoyed the TV series (starring Derek Jacobi as Cadfael), I've long wanted to read the books on which they were based. This first book in the series was a treat. Peters has an easy writing style, and the story was intriguing and kept my interest, even though having seen its TV twin I knew how it would play out. There are many parallels to the TV adaptation, but also some slight changes as well, which was ok. Brother Cadfael is a wonderful leading character. I am looking forward to seeing his arc through the next 20 novels. This is the first book of the Chronicles of Brother Cadfael series but not the 1st one I've read. Still more to come soon. 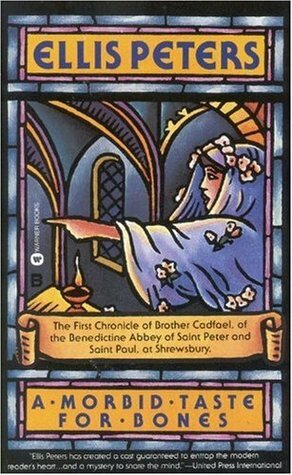 4* The This is the first book of the Chronicles of Brother Cadfael series but not the 1st one I've read. Still more to come soon. This is at its core a whodunnit however what sets it apart is the setting - 12 century in and around Shrewsbury. Now The first thing that I want to say is that this book (and in fact the whole series being written between the mid 70s and mid 90s) was ground breaking as no one had really broken the historical fiction genre and certainly not mixing it with the crime genre as well. However Ellis Peters did so and repeatedly. Now I am sure there were books in this style written before Cadfael and th This is at its core a whodunnit however what sets it apart is the setting - 12 century in and around Shrewsbury. Now The first thing that I want to say is that this book (and in fact the whole series being written between the mid 70s and mid 90s) was ground breaking as no one had really broken the historical fiction genre and certainly not mixing it with the crime genre as well. However Ellis Peters did so and repeatedly. but what of the book, well on one level it is a book of intrigue and mystery but what really makes it come alive is the historical references which were so diligently described and illuminated making the crime almost feel secondary. Now living in an area where there are a lot of medieval ruins and historical sites I have always struggled with envisioning them as living thriving sites - books like this (okay it IS a crime story after all) help me see a human and dynamic side and help me see that a story can be told in any location but the character of that location help give that story a unique flavour. I really enjoyed the Brother Cadfael series, except for the very last book. My favorite is Virgin in the Ice. If I take four days to read a 250-page story, I am unexcited. That is daunting because I have gathered over twenty of Ellis Peters' prolific novels! Her real name was Edith Pargeter. I thought I would love these mysteries which are so revered. I like the characters and originality of their attributes, setting, and era but positively winced over such indulgent writing: the most important aspect for me. I can read any subject if the author is captivating. "A Morbid Taste For Bones" is slow-paced a If I take four days to read a 250-page story, I am unexcited. That is daunting because I have gathered over twenty of Ellis Peters' prolific novels! Her real name was Edith Pargeter. I thought I would love these mysteries which are so revered. I like the characters and originality of their attributes, setting, and era but positively winced over such indulgent writing: the most important aspect for me. I can read any subject if the author is captivating. "A Morbid Taste For Bones" is slow-paced and needlessly wordy. I want to run shrieking over little else, than encountering the word "gently" beaten to death. I can't abide it once. Ellis displayed a grating habit for it! This series clearly achieved longevity. Writing does improve, sometimes from book to book. I am counting on that. I appreciate finally acquainting the Welsh, which I seldom found amidst my fiction thus far. I am a plant-lover who would enjoy seeing the protagonist at work as his monastery's botanist. Getting a glimpse of 1400 is eye-opening because people don't seem as primitive and under-equipped as I imagined. I needed that education. A soldier choosing retirement as a monk is interesting and gives Brother Cadfael humorous street-smart oomph. In a weird way, this book is pure nostalgia. I never read this book before, but my mother used to have the entire collection and in my memories it seems like she was constantly reading one of them while i was a kid (which is probably not really true, but you know how memories work! they are alway slightly distorting the truth). I saw this book a little while ago in the library and i just had to read it now. It is a nice, quick and enjoyable read. Not too much suspense (although i am glad i was able In a weird way, this book is pure nostalgia. It is a nice, quick and enjoyable read. Not too much suspense (although i am glad i was able to finish it in one day so i didn't have theories about the murderer running through my head when going off to bed). It's not really suspense, but some healthy curiosity. The first question is who will get killed, and the second one is who did it. A fun story featuring a medieval monk with a past. I really enjoyed this visit of Olde England, the myths, the travel. The villagers of Gwytherin are a wonderful group. There's not much I can say without giving away a mystery. The adventures of Father Cadfael and the others is a fun, human, warm story of murder, friendship, faith, hope, truth. Prior Robert wants to remove Saint Winifred's bones from a Welsh village to the monastery. Someone opposed to the plan is found dead. Brother Cadfael, former Crusader turned monk, suspects a fellow monk's responsibility for the murder and investigates. The author often uses medieval vocabulary, appropriate to the setting, which slows one's speed, but it is worth the reader's effort. Edith Mary Pargeter, OBE, BEM was a prolific author of works in many categories, especially history and historical fiction, and was also honoured for her translations of Czech classics; she is probably best known for her murder mysteries, both historical and modern. Born in the village of Horsehay (Shropshire, England), she had Welsh ancestry, and many of her sho A pseudonym used by Edith Pargeter.